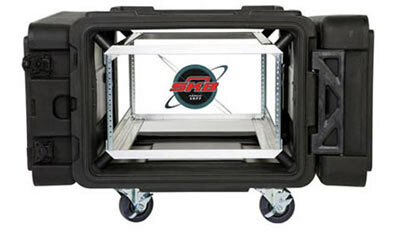 SKB�s new Roto Shock Mount cases come in rack depths of 20", 24", 28" and 30". These cases include a tough shell and integral molded valance that eliminates the need for a metal valance on the outside of the case. � Redesigned frame with threaded steel rails and aluminum cross components forming an H shaped rigid configuration. � Front and rear doors are fitted with rubber gaskets for water resistant protection. � Heavy duty recessed latches meet ATA and military standards. 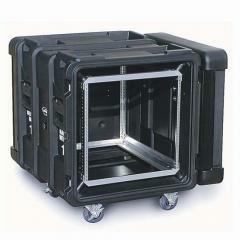 � Comes standard with eight elastomeric high dampening shock mounts with a load range of 40 to 150 pounds. � Additional or stiffer mounts may be ordered and are easily field-installable. � Molded in lugs for easy secure stacking.